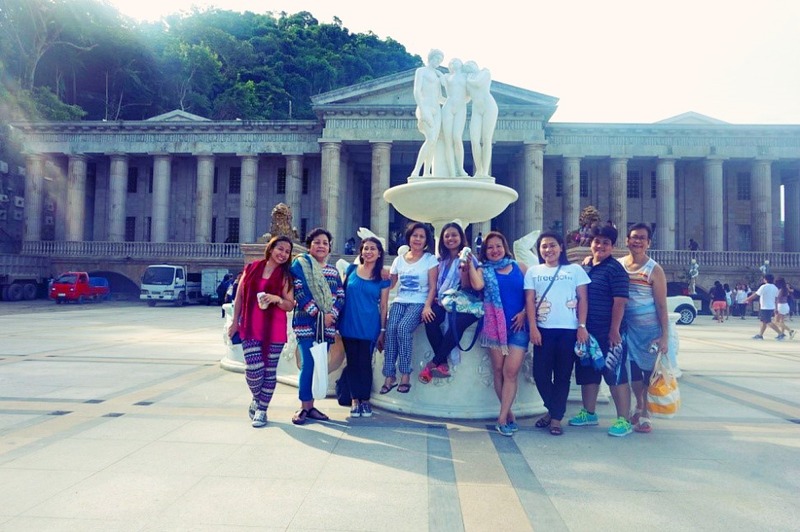 A new buzz is making some noise around the City of Cebu--the Temple of Leah. By the sound of it, I can hear a common name used by a Filipina contrary to my concept of a temple. I am inclined to associate the word with a place of worship by a new set of believers belonging to a different religious philosophy or faith other than Buddhism and Taoism. Out of curiosity or just to keep abreast with the trend, people (me included) are agog to find what the buzz is all about. Until one sunny day, my group set our feet on the attention-grabbing site. Feeling like in Rome or Greece? So, when I, together with my colleagues, reached the destination—oh by the way, we travelled the same route going to the Little Amsterdam in Barangay Sirao of Busay along Transcentral Hiway, but the only difference is that we traversed to the left when we reached a signage directing us to “this way to mountain park”—I was astonished by the height and enormity of the columns as we were passing by the side of the colossal structure. On its side, intricate designs of enormous figures of ancient Romans are engraved on the stones. Am I in Rome or Greece? It gave me that kind of feeling because I did not expect such a look-alike spectacular Roman or Greek architectural design to rise in Cebu! It made me feel so tiny a creature. We paid an entrance fee of P50 per head because, according to the notice displayed at the entrance, it is to defray maintenance expenses. Well, that is the business side of things. It is very apparent that the temple is unfinished. A lot is yet to be done but nevertheless, the owner is generous enough to allow the visitors to have a peep while it is in-the-making process. 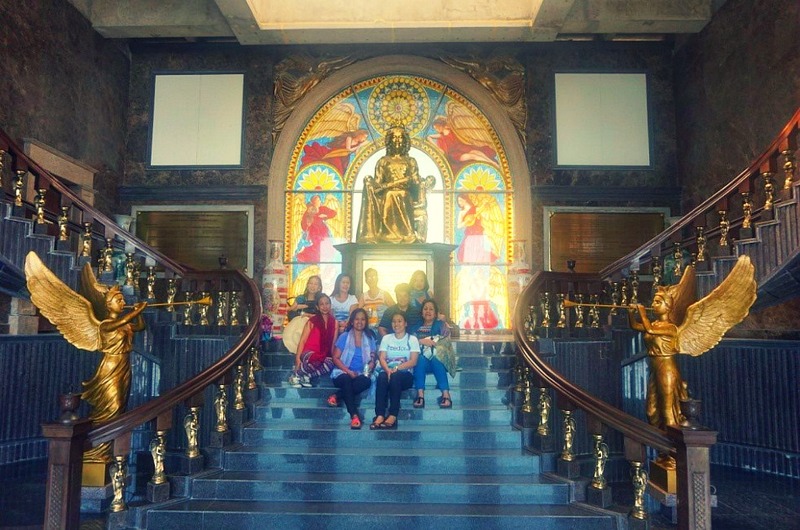 I am certain that, by the time the construction is completed, a second visit is worth the wait because it is a one of a kind memoir of Cebu to this present generation and that is yet to come. 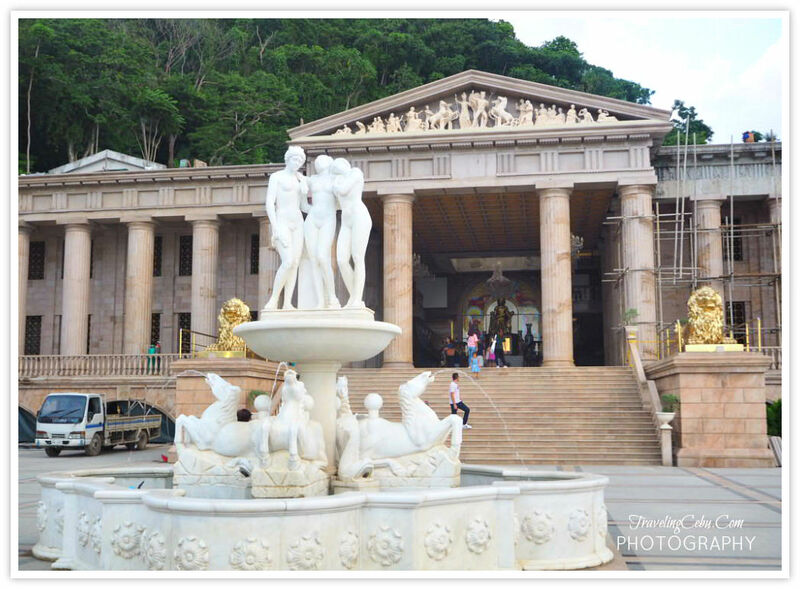 It will be another great plus to Cebu's landmarks. As we stepped up hill, the path to the temple is a stony and dusty road. Not cemented yet. The vast foyer becomes the reception area where people of different race come and enjoy their groufies or selfies. The lobby is surrounded with full-sized maidens made of porcelains positioned everywhere by the rails. At the middle of the lobby is a fountain with the naked maidens (good! they are not men) and the horses. Benches are also found along the sides of the balcony so guests can relax after walking through the dusty and stony path. They can take pleasure from people-watching kind of activity. Even lovers can take a holiday in this place and savour their sweet-nothing promises. 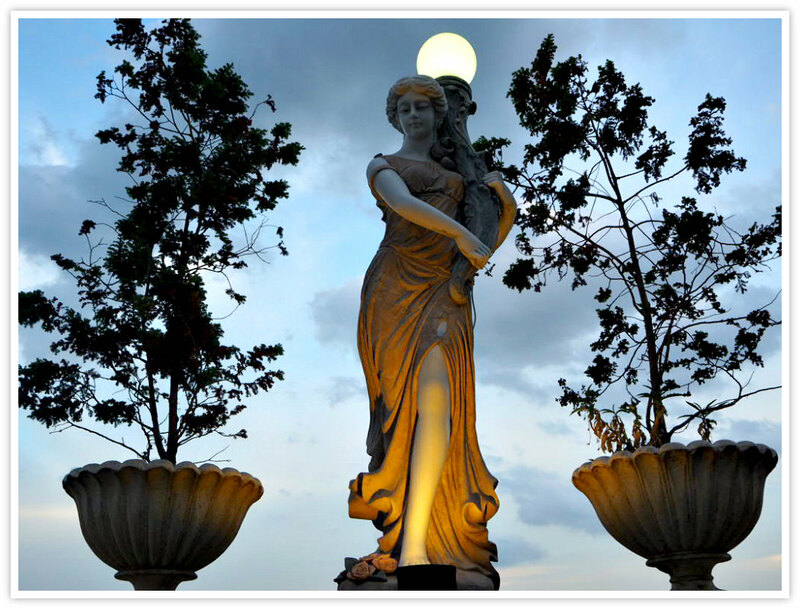 Visitors will surely like overlooking the city and the coolness and freshness of air breeze as it touches their faces. Eat snacks as food stalls are stationed near the entrance of the lobby. Do pre-nuptial pictorials for P2,500. As we moved up on a flight of stairs directing to the golden statue of Leah, gigantic golden lions are fixed at the sides of the doorsteps which, to me, are likely to serve as guards (as if they can roar)! Here, the lifetime collections of Leah are preserved in the art gallery, museum, and a library. From the bottom of the stairways to the last step, there sits the statue of Leah, a 9ft-bronze with writings carved on the bronze plated stone. For every article, each has a story to tell—this Temple of Leah has a story to tell. 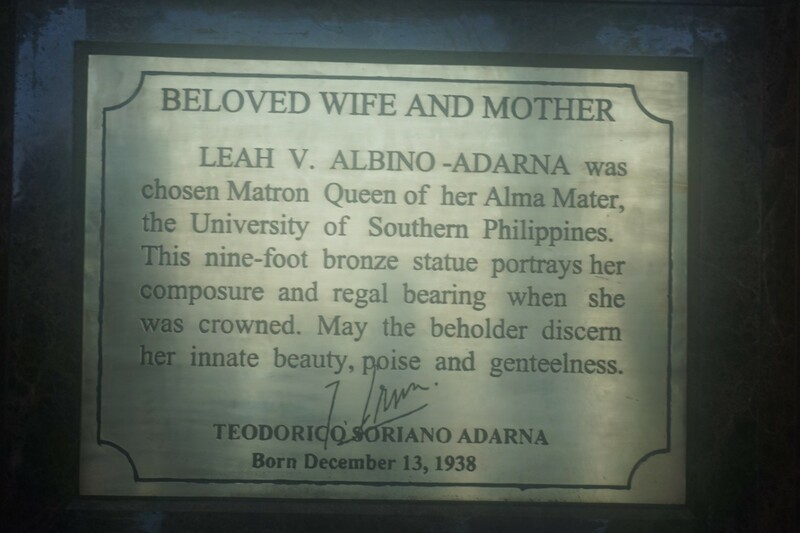 The Leah here refers to the one and only Leah V. Albino-Adarna, the beloved wife of Teodorico Soriano Adarna, the man who made this temple possible to build as a symbol of his undying love and ceaseless devotion to his beloved Leah, his wife for 53 years, as the inscribed words say so. Under her throne are beautifully written words to describe her character. American-Heritage Dictionary defines it as an elegance by virtue of fineness of manner and expression. Genteelness is meant to describe Matron Leah as one whose behaviour shows a sign of good breeding or her elegance demonstrated by the fineness of her manner. So, there is no way that “genteelness” could have been erroneously spelled because that is meant to be there as it is. 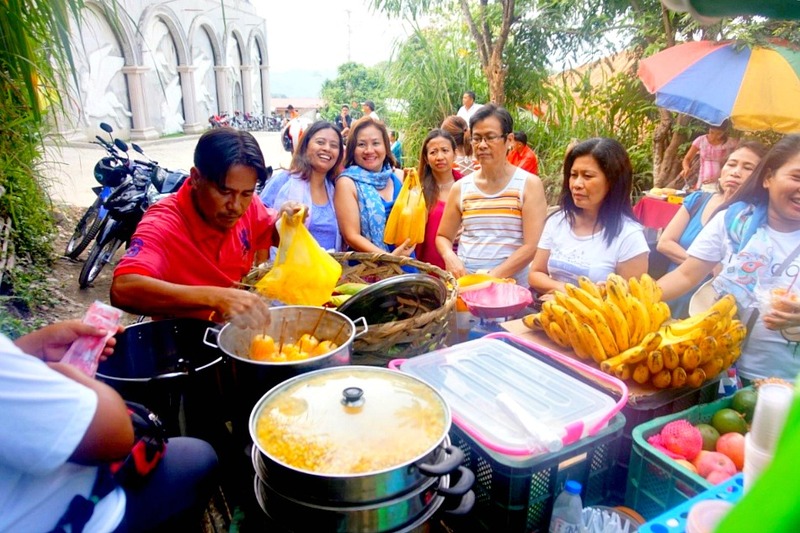 More than the profound expression of his undying love, “this Temple will become a landmark of Cebu where future generations of the Adarna clan coming from her can come and trace their roots and heritage,” so does the inscription say. With that profession of love for a wife, Temple of Leah is not after all a place of worship. Temple of Leah is a Temple of Love. Maybe, or just maybe, Leah is Love and Love is Leah for one Teodorico S. Adarna. Hmmm sounds great!! They are actually corn on a cob loaded in a car. But, there are no vendors smarter than the Cebuanos. They can even be creative—case at point is the selling of corn. First, after doing a few rounds in the gargantuan house of love, some may have a cup of grated Japanese corn sprinkled with cheese or barbecue powder for a snack or a whole corn on a cob, and others may buy uncooked pieces of corn. Second, this open-back car is situated outside the entrance of the temple thus making this position a good strategic location for business. Third, the vendors do not have to rent a stall or space because their products are loaded in their car. In fact, it is doing very, very good. Just imagine the people coming in and out of the site. It makes a lot of money. Grabcar or Grabtaxi, if promo is available. Book your ride when you are already at JY Square so that distance is shorter, hence lesser fare. Thank you for reading this page. 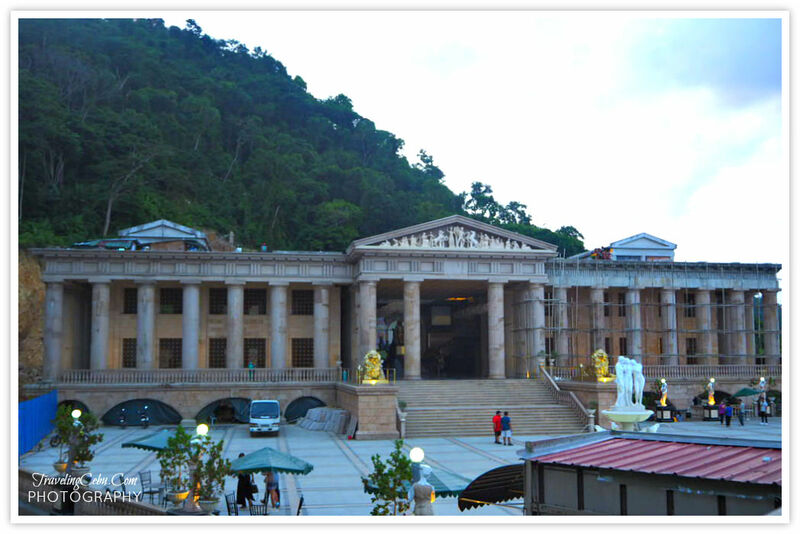 Hope you'll enjoy the temple and its amazing landscape and panorama.